With summer vacation drawing to a close and school supplies filling the stores, families are beginning to anticipate the return to school. Many children may feel excitement, some nervousness, and an eagerness to see their friends and start a new grade. Many others may approach this transition with a sense of anxiety – feeling overwhelmed, worried, apprehensive, fearful, tense, or concerned about the new year. For children struggling with anxiety, a new teacher, new classmates, new classroom, and new expectations all in one day is a lot to handle. Here’s how parents can help. Practice coping skills. Learn how anxiety works so you can help your child understand what is going on in their mind and body. Remind your child that the worry they are experiencing does not affect or predict what is actually going to happen. Teach your child calming strategies like deep breathing and progressive muscle relaxation, and teach them to focus on the positives. Write all of the coping skills you practice on a recipe card or cardstock and put it in their backpack so they have access to it during the school day. Make a plan. Help your child feel more prepared and have a better idea of what to expect by planning ahead. Together with your child plan the weekday routine, choose breakfasts and lunches for the first week, choose the outfit for the first day, and shop for school supplies early. If your child will be starting at a new school, walk or drive the route a few times and visit the playground. If possible, request a tour so your child can see their classroom and learn where the bathrooms, water fountains, exits, etc are located. Having this plan in place ahead of time will reduce the unknowns and help mitigate your child’s anxious thoughts and feelings. Plan your routine and practice it. Together with your child, choose age-appropriate bed times and wake times. Consider asking your child if they want you to wake them up or if they are ready for an alarm clock and the responsibility of getting themselves ready. Write out their night time routine and their morning routine so they have a visual to follow, and start following the routine about a week before school begins so their bodies can adjust to any sleep changes. Listen with empathy. Find a quiet moment during the day or before bed to ask your child how they’re feeling. Listen in a non-judgmental, accepting way, and resist the urge to react, persuade, or fix the problem. Trust your instincts – you’ll have a sense of whether they could use some professional help sorting through these feelings and learning how to manage their anxiety, or if talking it out with a parent is enough. But still make them go to school. School avoidance will reinforce the fears and can lead to bigger problems down the road. Instead, support your child through empathy, a solid routine, calming strategies, and keeping your own cool. Leave some extra time in the mornings so that a time crunch doesn’t escalate the situation. If possible, have your child arrive at school with a friend for the first few days. Keep it positive and reward their efforts. Anxiety already feels big and scary, and can bring a host of physical symptoms, so punishments are not motivating. Be on your child’s team to tackle the problem together. Empower them to find their courage when they feel scared. And remember to praise their efforts and their sucesses along the way. They’ve got this, and you’ve got their back! Several of the Psychologists and Psychotherapists at Kanata Psychology & Counselling Centre are experienced in working with children to overcome emotional issues such as anxiety. 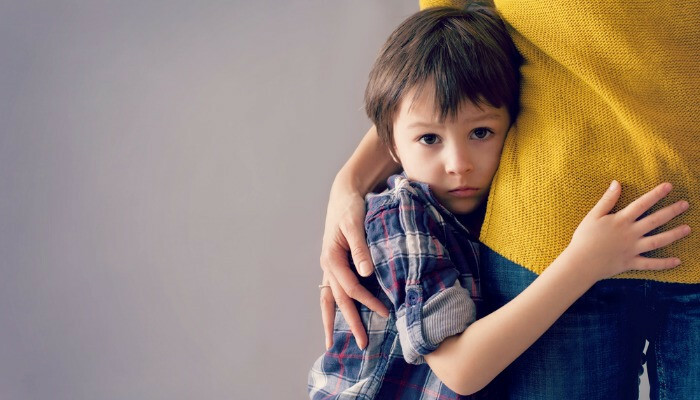 If, however, your child is in crisis please call a helpline such as Kids Help Phone (1-800-668-6868), or for youth 12-20 years old the Youth Services Bureau of Ottawa (613-260-2360). Kara Morris is a Registered Psychotherapist and a Creative Arts Therapist at the Kanata Psychology & Counselling where she specializes in working with children and adolescents who have behavioural and emotional disorders, post-traumatic stress disorder, first-hand and inter-generational trauma, and developmental disabilities, as well as with those from diverse cultural and socio-economic backgrounds. If you are interested in speaking with Ms. Morris, please call (613) 435-2729 or e-mail office@kanatapsychology.com to book an appointment. Alternatively, you can click the “Book an Appointment” button above and select Kara Morris as who you would like to meet with. → Kanata Psychology opens Kanata Learning Centre! Kanata Psychology and Kanata Learning Centre Announce Affiliation with 5 Star Camps! 12 Innovative Strategies to Understand and Nurture your Child’s Development.